Groundhog Day is February 2, which is right around the corner. To get ready to celebrate, let's take a look at a new book about groundhogs that just came out last month, The Amazing Groundhogs of Woodchuck Wonderland by Susan Sam and Joseph Sam. Susan and Joseph Sam are passionate proponents for groundhogs. Their website Woodchuck Wonderland™ has long been an inspirational source of information, photographs, and videos that come from years of studying these often-ignored rodents. Now they have published a 36-page paperback that will delight children of all ages. First up in the book, they present Wilhelmina, a special woodchuck that first introduced them to the joys of observing woodchuck behavior. Next they discuss what a woodchuck (or groundhog) is -- technically large squirrels of the marmot family -- and describe their life cycles, including hibernation. Did you know baby groundhogs were called chucklings? The rest of the book reveals what woodchucks eat and all sorts of interesting facts about them, all illustrated with large color photographs. The Sam's call themselves "The People" in the text and admit at times that the woodchucks' activities are at odds with their own. Last year I looked for a books about groundhogs for a young relative who had developed an interest in them and the pickings were slim. The Amazing Groundhogs of Woodchuck Wonderland is a much-needed book that fills a special niche. Dig up a copy today! When it is cold outside and/or food supplies are low, certain animals are able to slow their heart rates and breathing rates, lower their body temperatures, and go into an extended resting state. Rodents, in particular, are known to hibernate. Make a list of animals that hibernate. What do animals that hibernate have in common? How are they different? The Illinois Department of Natural Resources hibernation page is a good place to start. Gather: Watch or other timing device that will measure one minute in seconds. Teach children how to find their pulse (details at Women's and Children's Health Network). Count the pulse for one minute. Most children at rest should have counts around 60-100 beats per minute (faster than adults). Have them walk around or do some exercises in place. Then count again. If they are struggling to count for a minute, have them count for 15 seconds and multiply by 4. Now explain that in bears the number of heart beats go from 84 in an active bear to 19 beats per minute in a hibernating bear (ScienceDaily). Other animals my drop to 4 or 5 beats per minute. That is slow! Animals that hibernate must put on a heavy layer of fat to act as an energy reserve while they are not active or feeding. How do they do it? Did you know that one source of food for bears is moths? Studies have shown that bears in Yellowstone Park eat as many as 40,000 moths a day in preparation for hibernation (Smithsonian). The moths themselves have big fat reserves they have stored for their own preparation for overwintering. Woodchucks eat mostly plants. What kinds of plants might be best for the woodchucks to eat if they want to make fat? What does this groundhog have in its front paw? Can you see? It is picking up fruit from under a mulberry tree. It has an ability to grasp its food like other members of the squirrel family. 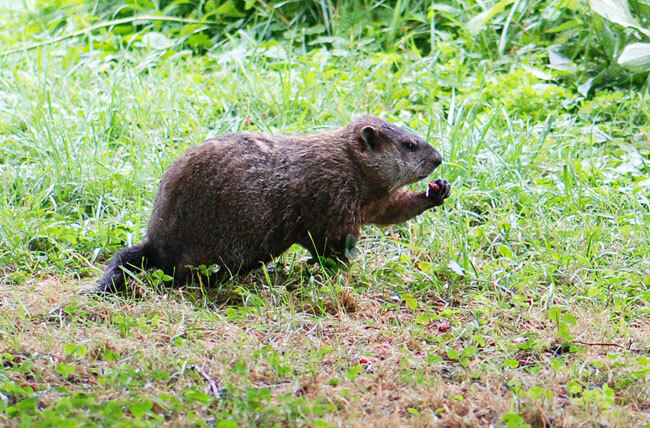 If you are lucky enough to live where woodchucks occur, observe what they eat. Does what they eat change as they approach the time to hibernate? Visit TeachHub for more classroom activities about hibernation. 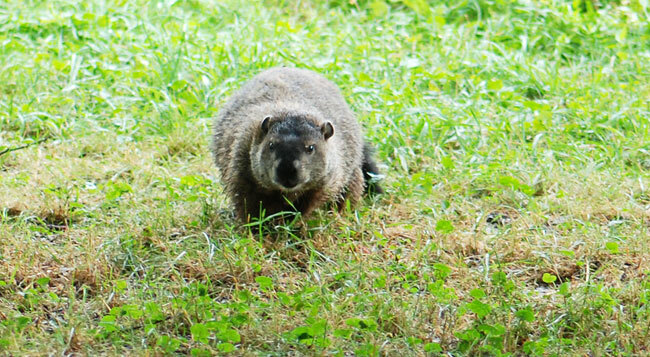 And don't forget, The Amazing Groundhogs of Woodchuck Wonderland.